SuperBills are a simple way to gather and record patient information on a single sheet of paper. But creating them and keeping the codes up to date can be a real pain. The Find-A-Code SuperBill Builder eases this pain by helping you quickly build and update SuperBills. Additional SuperBills may be purchased by contacting Find-A-Code's Customer Service: support@findacode.com or 801-770-4203. ABC Codes support reimbursement for non-physician health professionals and holistic doctors (there are over 2 million of you) who lack good descriptions of services in conventional medical code sets. Find-A-Code's Superbill Builder has automated the process of using ABC codes mapped to the codes required for billing insurers to help you justify the cost of your services AND also reduce your potential liability (fines for fraudulent billing can be as high as $10,000). Your subscription to the SuperBill Builder includes a PDF copy of the latest ABC Coding Manual as well as cross-links between ABC codes and the CPT/HCPCS codes you will use for billing. As ABC Codes are entered into the SuperBill Builder, you will be shown or prompted to pick relevant CPT/HCPCS codes. When filling out your medical claim form, you will use the releated CPT/HCPCS code. 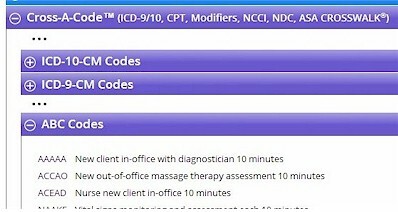 For ABC codes that crosswalk to multiple CPT/HCPCS codes you can select the most appropriate code for your practice from the handy drop-down list. How do you count the SuperBills? What does "3 SuperBills" mean? When you start creating a SuperBill you will be asked for the provider's name. Once the provider's name has been entered it CANNOT be changed. So be sure you type it in correctly. All other aspects of the SuperBill may be edited an unlimited number of times except the provider's name. What do I do if I put the wrong provider name in or I mispelled it? Contact Find-A-Code's Customer Service: support@findacode.com or 801-770-4203 and they will unlock the provider name for a one time edit. What if I need more than 3 SuperBills? Some of my buttons are red, why is that? Every 3 months when you go into the SuperBill Builder it will check the codes you've selected for your SuperBills to see if any of the codes have been deleted or had their descriptions change. If any deletions or changes are found, your "1 Procedures" and/or "2 Diagnosis" buttons will appear red. Edit your procedures and/or diagnosis to update your codes and descriptions as needed.